he did it on the thigh. He did it because his socks weren’t sparkling white. He did it because I had the mean face of a fish. He did it because he simply ran out of things to say. He did it because he felt like it. the ghost left the house. or to love the hand that finds my own. or the milk that slides from the root. a soft bladder in its teeth. It will creep. It will slow its big shining feet. It will bite. The rain will dribble on the stairs until morning. 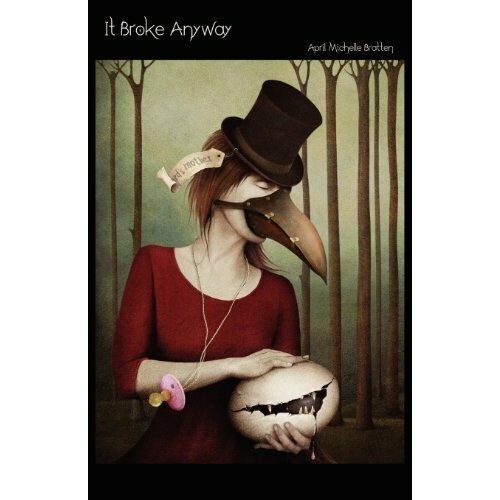 Today’s poems are from It Broke Anyway (NeoPoiesis Press, © 2012 by April Michelle Bratten), and appear here today with permission from the poet. April Michelle Bratten was born in Marrero, Louisiana. She received her Bachelor’s degree in English Literature from Minot State University in Minot, North Dakota. April was a finalist for the Best of the Net award in 2009 and was nominated again in 2010. She was also nominated for the 2010 Pushcart Prize. Her work has been widely published in both print and online, including the journals Istanbul Literary Review, Santa Fe Literary Review, San Pedro River Review, Southeast Review, Gutter Eloquence, Kill Poet, The Orange Room Review, and Dark Sky Magazine among others. She co-edits and writes book reviews for the online literary journal Up the Staircase Quarterly, which can be found at www.upthestaircase.org. Want to see more by April Michelle Bratten? This entry was posted in April Michelle Bratten and tagged American Gothic Poetry, American Poetry, Feminist Poetry, Poetry, Poetry of Faith, Poetry of Loss. Bookmark the permalink.